AMERICAN RADIO RELAY LEAGUE "By 1914, there were thousands of Amateur Radio operators--hams--in the United States. 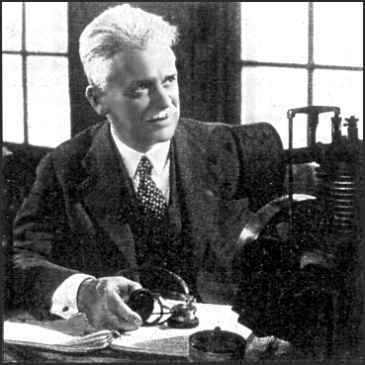 Hiram Percy Maxim, a leading Hartford, Connecticut, inventor and industrialist saw the need for an organization to band together this fledgling group of radio experimenters. In May 1914 he founded the American Radio Relay League (ARRL) to meet that need." HOW can our poor words convey adequately our emotions towards the man who gave organized amateur radio its life? For Hiram Percy Maxim was more than the president of A.R.R.L., he was its founder, the one who first envisioned its glorious possibilities as a field for good in human life--the one who formed the organization, breathed into it the breath of life and was its constant inspiration. The amateurs of America would have no other president, those of the world no other leader. But Mr. Maxim was more than the presiding genius of amateur radio. He was one of the greatest men of our times, a man whose superlative qualities have left their impress upon many diverse walks of life. We are not alone in mourning him; many an art, many a group of doers and thinkers, both in this country and abroad, feels his loss even as we. The Maxim family were French Huguenots who came to this country in the middle seventeenth century to escape religious persecution, landing first at Plymouth, then moving to Maine. Hiram Percy was born in Brooklyn, September 2, 1869. His father was the late Sir Hiram Stevens Maxim, inventor of the Maxim machine gun, his uncle the late Hudson Maxim, inventor of high explosives. He attended Brooklyn schools and the Massachusetts Institute of Technology, graduating from the School of Mechanical Arts there in 1886, the youngest member of his class. He was a practising engineer at the age of seventeen! 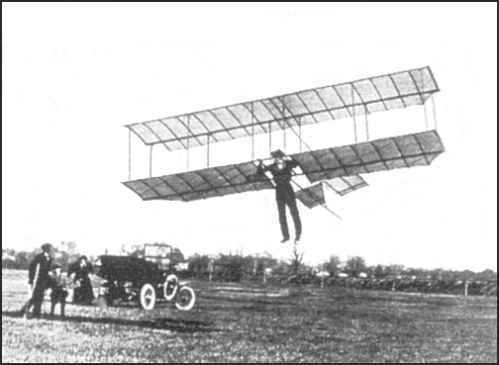 MR. MAXIM'S EARLY GLIDER in flight over the Hartford meadows, present site of Brainford Field. Mr. Maxim is seen on crutches at the left, after a glider crash in which he injured a knee. He was greatly interested in aviation. pioneer glider enthusiast, he badly injured a knee in a glider accident in his younger years. He was one of the originators of the Aero Club of Hartford, was for many years chairman of Hartford's Aviation Commission, and was the man who first envisioned Hartford's municipal aviation port, Brainard Field, where W1MK is now located. 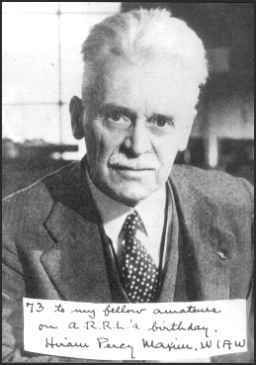 IN HIS SILENCER LABORATORY Mr. Maxim was an authority on acoustics, the inventor of the Maxim Silencer. He is here shown in his experimental laboratory. The 'phone and log are reminiscent of amateur radio. Let us put to one side for a moment Mr. Maxim's radio career and touch first upon some of his other accomplishments. He was an inventive genius by inheritance. In all, fifty-nine patents were issued in his name, in many of the mechanical arts. He was not, however, an inventor of implements of warfare, as incorredtly reported in the press recently. He is perhaps best-known as the inventor of the Maxim Silencer. Originally a highly ingenious gun silencer, the Maxim Silencer of to-day finds its application in industry, upon the exhausts of motors and the intakes of compressors. They run from small gadgets to great brutes intended for Diesels, shipped in sections on flat cars. Mr. Maxim was a pioneer in visualizing silenced air conditioning for buildings and homes, and in 1930 demonstrated an ingenious development of his organization, the Maxim window silencer, a box-shaped affair that went in a window and permitted ventilation while excluding street noise. An authority on acoustics, humanity is indebted to him for many developments that will make complex urban life more bearable. He was an enthusiastic motion-picture amateur and gave to this field the same ardent support that he did to amateur radio. In 1926 he had noticed the same necessity for organization in this field that he had previously noted in amateur radio, and as a result of his personal efforts there came into being the Amateur Cinema League, an amateur organization similar in structure to our A.R.R.L., of which he was also the founder and only president. Countless movie amateurs honored Mr. Maxim as their chief, the same as we do, and A.C.L. and A.R.R.L. are one in this loss.